Purchase this print on 11x17 inch 100% acid free heavy duty premium paper. The image is about 9.5x12 inches. The watermark does not appear on the finished print shipped to your home. The prints are shipped in a box via USPS Priority Mail and usually arrive in less than five US Mail days from the date of your order. Click here for more purchase information of my artwork. To check out other artwork by Doug Dourgarian and see more links for his online art gallery click here for his web gallery of art and high heel museum. Click here to leave High heel shoe art for more links to artistic styles, artists and their online art galleries, art prints and art posters. Browse the links found at the bottom of Home Page. 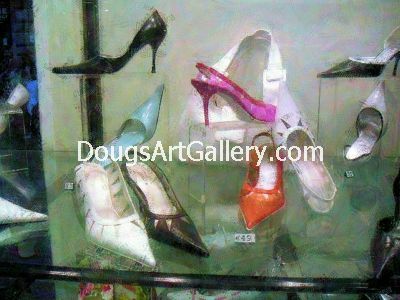 Be sure to see more of Doug’s Shoe Art in the High Heels Gallery .